Fixed issue: When running FolderTimeUpdate in the first time without .cfg file, the window of FolderTimeUpdate was too small and the start button was hidden. Added 'Skip files that match the following wildcards' option. Fixed bug: FolderTimeUpdate failed to update the creation time if the folder had 0 files. Fixed FolderTimeUpdate to save the empty folder date/time value to the .cfg file. Added 'Set the modified time of empty folders to their created time' to the 'Empty Folders' option. Fixed bug: When using command-line, FolderTimeUpdate saved the files in ANSI encoding, but Added Byte order mark of Unicode. FolderTimeUpdate.exe /BaseFolder "c:\MyFiles" /scomma "c:\temp\updatelog.csv"
Fixed FolderTimeUpdate to save the current settings to the config file if you exit without clicking the start button. Added 'Skip files that their date/time is greater than the current time' option. Added option to update the creation time of folder in 3 different methods: Update the created time with the same value of modified time, update the created time accoding to the oldest created time of files inside the folder, or update the created time accoding to the oldest modified time of files inside the folder. Added 'Run As Administrator' option (Ctrl+F11), which allows you to easily run FolderTimeUpdate as administrator on Windows Vista/7/8/2008. You should use this option if you get a 'Access is denied' error while trying to update the folder date/time. Added option to specify one or more wildcards (delimited by comma) to scan. For example, if you type in this field '*.exe', only the .exe files will be used to calculate the modified time of the folder. Added 'Mark Items With Time Change' option. Added 'Display only items with time change' option to the Log Display combo-box. Added 'Skip hidden and system files' option. Added 'Files' and 'SubFolders' columns, which display the number of files and subFolders in every folder. Added 'Update also the base folder' option. Added option to drag a folder from Explorer into FolderTimeUpdate window in order to choose the desired folder. Added 'Open Selected Folder' option. Fixed bug: Failed to show dates earlier than 1985. Fixed bug with the accelerator keys. After running FolderTimeUpdate, you can choose the desired base folder and the other options and then click the 'Start' button to start updating the modified time of all folders. If you're not totally sure that the 'Modified Time' change is right for you, you can choose the 'Simulation Mode' option. When 'Simulation Mode' is on, FolderTimeUpdate will only display the changes of the modified time that will be made for all folders, but without actually applying these changes. Starting from version 1.35, you can update the date/time of folders from command-line, without displaying any user interface. 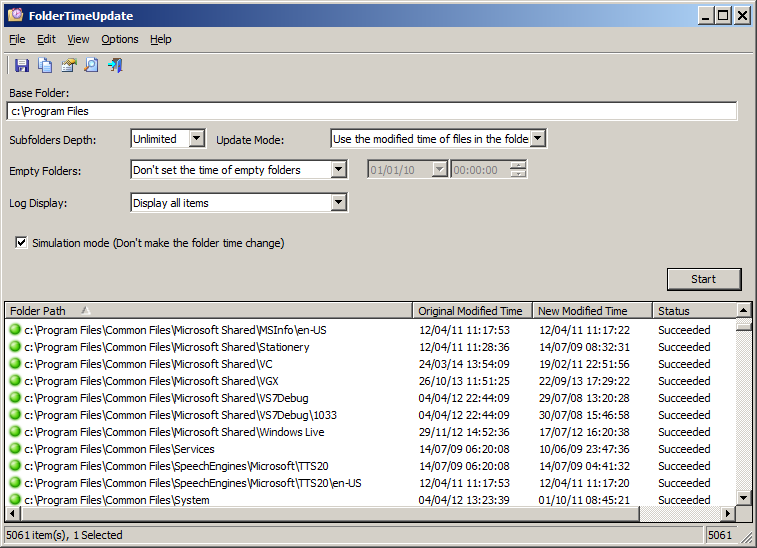 The result of the folder date/time update will be saved into the specified log file. You can also override the settings saved in the .cfg file by specifying the same variable name in the command-line... For example: Inside the .cfg file, the base folder is stored as 'BaseFolder=folder', so you can override this value by specifying the /BaseFolder in command-line. /cfg <Config File> Start FolderTimeUpdate with the specified config file. /stext <Filename> Update the date/time of folders and save the log to a simple text file. /stab <Filename> Update the date/time of folders and save the log to a tab-delimited text file. /scomma <Filename> Update the date/time of folders and save the log to a comma-delimited text file (csv). /stabular <Filename> Update the date/time of folders and save the log to a tabular text file. /shtml <Filename> Update the date/time of folders and save the log to HTML file (Horizontal). /sverhtml <Filename> Update the date/time of folders and save the log to HTML file (Vertical). /sxml <Filename> Update the date/time of folders and save the log to XML file. A file named FolderTimeUpdate_lng.ini will be created in the folder of FolderTimeUpdate utility. After you finish the translation, Run FolderTimeUpdate, and all translated strings will be loaded from the language file. If you want to run FolderTimeUpdate without the translation, simply rename the language file, or move it to another folder. FolderTimeUpdate is also available in other languages. In order to change the language of FolderTimeUpdate, download the appropriate language zip file, extract the 'foldertimeupdate_lng.ini', and put it in the same folder that you Installed FolderTimeUpdate utility.